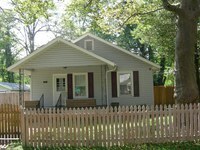 One-story frame bungalow with a front gable roof, German siding, and attached front porch. Front gable roof on porch, replacement iron posts and no balustrade. Interior brick chimney, four-vertical-over-one windows, multi-light front door, small level lot. It appears from city directories that Jacob H. Beck, a farmer, and wife Ruemma lived here by 1926. Mrs. Ruemma Beck was still living in the house in 1938. From 1939 to 1940 Robert A. Coffey, an insurance agent, and wife Chloe lived here, with Mrs. Coffey continuing to reside in the house through 1942. From 1943 to 1951 Fred L. Swilling, a piano tuner, lived in the house. Beginning in 1952 Quay H. and Mary S. Beck lived in the house. One-story front gable roof garage with German siding.